What is De Quervain tenosynovitis? De Quervain tenosynovitis is an entrapment tendinitis of the tendons contained within the first dorsal compartment at the wrist. It is an inflammatory condition affecting the tendon sheaths (tenosynovitis) that pass over the wrist joint. The inflammatory response occurs following injury and leads to the symptoms of pain, heat, redness, swelling and loss of function. This is particularly noticeable when forming a fist, grasping or gripping things, or when turning the wrist. The tendons of the abductor pollicis longus and the extensor pollicis brevis are tightly secured against the radial styloid by the overlying extensor retinaculum. Any thickening of the tendons from acute or repetitive trauma restrains gliding of the tendons through the sheath. De Quervain's tendinitis is caused when tendons on the thumb side of the wrist are swollen or irritated. The irritation causes the lining (synovium) around the tendon to swell, which changes the shape of the compartment. This makes it difficult for the tendons to move as they should. Tendinitis may be caused by overuse. It can be seen in association with pregnancy. It may be found in inflammatory arthritis, such as rheumatoid disease. De Quervain's tendinitis is usually most common in middle-aged women. In 1895, a Swiss surgeon, Fritz de Quervain, published 5 case reports of patients with a tender, thickened first dorsal compartment at the wrist. The condition has subsequently borne his name, De Quervain tenosynovitis. The two tendons concerned are the tendons of the extensor pollicis brevis and abductor pollicis longus muscles. These two muscles, which run side by side, have almost the same function: the movement of the thumb away from the hand in the plane of the hand—so called radial abduction (as opposed to movement of the thumb away from the hand, out of the plane of the hand -palmar abduction). The tendons run, as do all of the tendons passing the wrist, in synovial sheaths, which contain them and allow them to exercise their function whatever the position of the wrist. Evaluation of histological specimens shows a thickening and myxoid degeneration consistent with a chronic degenerative process. The pathology is identical in de Quervain seen in new mothers. De Quervain is potentially more common in women; the speculative rationale for this is that women have a greater styloid process angle of the radius. Patients with De Quervain tenosynovitis note pain resulting from thumb and wrist motion, along with tenderness and thickening at the radial styloid. Crepitation or actual triggering is rarely noted. Swelling may be seen over the thumb side of the wrist. This swelling may occur together with a fluid-filled cyst in this region. 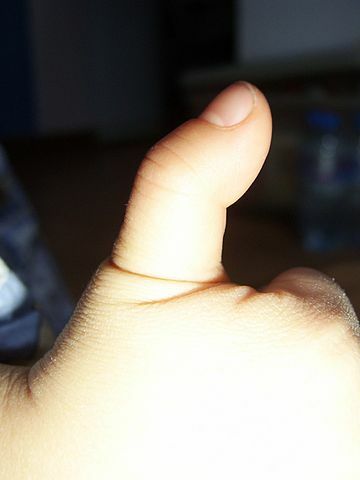 Numbness may be experienced on the back of the thumb and index finger. This is caused as the nerve lying on top of the tendon sheath is irritated. The first dorsal compartment over the radial styloid becomes thickened and feels bone hard; the area becomes tender. Usually, the compartment's thickening so distorts the sparsely padded skin in this area that a visible fusiform mass is created. Finkelstein's test is used to diagnose de Quervain syndrome in people who have wrist pain. To perform the test, the examining physician grasps the thumb and the hand is ulnar deviated sharply. If sharp pain occurs during Finkelstein test along the distal radius (top of forearm, about an in inch below the wrist), De Quervain's syndrome is likely. Tenderness is absent over the muscle bellies proximal to the first dorsal compartment. Tenderness and pain on axial loading are absent at the carpometacarpal (CMC) joint unless the patient has arthritis in that joint. Radiographs are negative and are not necessary for routine diagnosis. However, it should be emphasized that radiographs should be obtained to rule out other conditions that may be responsible for the patient's pain. Radiographs may be helpful in differentiating the patient who has de Quervain tenosynovitis from one who has osteoarthritis at the thumb carpometacarpal (CMC) joint or who is suffering from both conditions. Rest, ice and NSAIDs may provide relief and reversal of this condition, especially if it is caught early enough. Splinting with a thumb-spica splint may be necessary to reduce the movement of the wrist and lower joints of the thumb. If these interventions do not work, then a cortisone shot into the irritated area may be the next course of action. Physical therapy may also be used to retrain movements to avoid or change the method of those daily actions that caused the inflammation. The final step, if all other interventions fail, is surgery to release the tendons and provide more space for them to move. Following the surgery physical therapy may still be required to retrain the movements that caused the injury. What can a physical therapist do to help in De Quervain tenosynovitis? Cold laser treatments are becoming more common with a high success rate for reducing localized swelling of tendons (tendonitis). More and more physical therapy and hand centers are finding this modality to be useful for De Quervain's syndrome. Surgery may be recommended if symptoms are severe or do not improve. The goal of surgery is to open the compartment (covering) to make more room for the irritated tendons. Although de Quervain tenosynovitis features a simple tendon entrapment and the treatment is quick and straightforward, complications can be profound and permanent. Careful attention to surgical technique at the initial release is paramount to avoiding complications. Superficial radial nerve injury is the most irksome complication. Sharp injury, traction injury, or adhesions in the scar can cause neuritis in this high-contact area, greatly limiting hand and wrist function. This complication is best avoided through careful blunt dissection of the subcutaneous tissue and gentle traction. Persistent entrapment symptoms are possible if the tendon slips of the abductor pollicis longus are mistaken for the tendons of the abductor pollicis longus and the extensor pollicis brevis. In such a case, the extensor pollicis brevis tendon may remain entrapped within the septated first dorsal compartment. Should repeat cortisone injections fail to relieve symptoms, careful surgical re-exploration may allow a previously overlooked tendon to be released. Subluxation of released tendons is possible. With wrist flexion and extension, the tendons of a widely released first dorsal compartment snap over the radial styloid. This complication is best avoided by carefully limiting the release to the thickest mid – 2 cm of the first dorsal compartment or by reconstructing a loose roof to the released sheath. Reconstruction of the sheath with a slip of local tissue may relieve symptoms. Prevention of overuse injuries commonly requires breaking up sessions of work or practice involving a particular area into shorter periods with more frequent breaks to allow that area to rest and avoid the overuse. A proper warm up before doing any lifting, grasping or holding for extended periods may prepare the tendons for the task and prevent some of the strain placed on them. Avoidance of activities that cause pain is a common sense prevention method that often gets ignored. If a movement causes pain, find another activity or action that accomplishes the same task without the pain. Flexible muscles reduce overall tension on the tendons, which reduces the inflammation to the sheaths that cover them. John A. Papa, DC, FCCPOR(C). Conservative management of De Quervain’s stenosing tenosynovitis: a case report. J Can Chiropr Assoc. Jun 2012; 56(2): 112–120. Backstrom KM. Mobilization with movement as an adjunct intervention in a patient with complicated de Quervain's tenosynovitis: a case report. J Orthop Sports Phys Ther. 2002 Mar;32(3):86-94; discussion 94-7.